Hi everyone! Happy Wednesday! As promised, I’m getting back into my Whip it up Wednesday posts! So, because my camera is still dead, I was able to take pictures from my new Blackberry which has a pretty decent camera, but the pictures aren’t the best. So, here are 3 more recipes from Real Girls Eat! This was pretty good. I think it was missing something though…I think the next time I make it, I’ll add another clove of garlic and maybe some salt (I was out!) 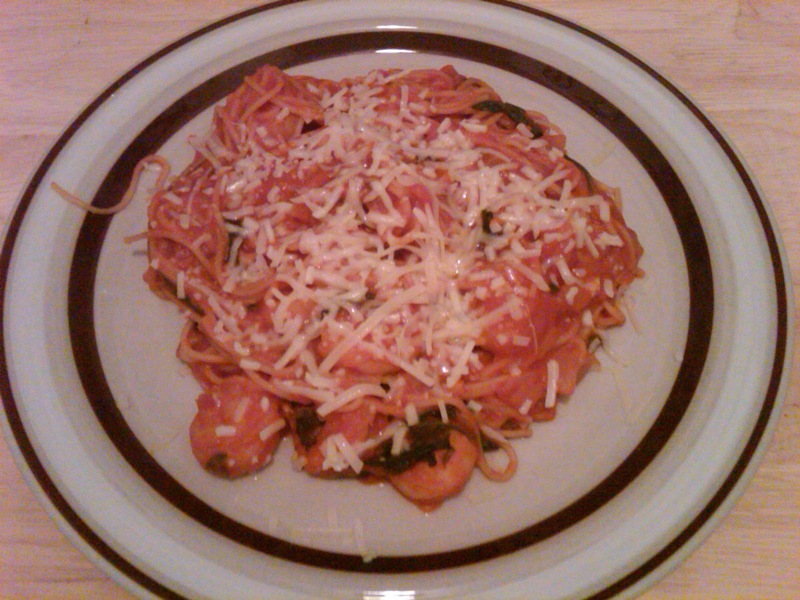 but it was a good, filling dinner and was quick and easy to make! 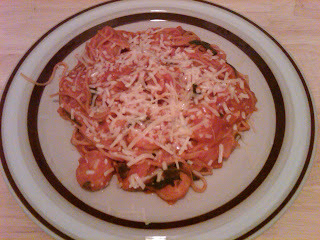 Basically, I sautéed garlic and onions, mixed in some shrimp, tomato puree and spinach and poured it over some whole wheat angel hair pasta! Delicious! I was really hesitant to make this because the idea of dried fruit in a couscous didn’t sound appealing and it was pretty good but I don’t know that I would make it again. My roommates loved it though, so I’ll post the recipe! -Cook the couscous according to directions. -Mix together the olive oil, lemon zest and juice, vinegar and s&p. Place in a small saucepan and heat gently until just warm. -While heating the dressing, roughly chop the dried fruit into similar sizes. Mix with the crystallized ginger in a serving bowl and pour the warmed dressing over. -Dice up the cucumber, feta, onion and toss into the serving bowl, mixing with the dried fruits and coating with the dressing. 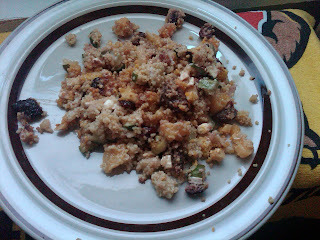 -Scoop the couscous into the serving bowl and toss gently to mix through. -Tear the fresh herbs and mix into the salad. -Toast the sliced almonds and mix into the salad. This was delicious! A Thai Curry made with jasmine rice, curry paste, white onions and coconut milk, it was absolutely fantastic! 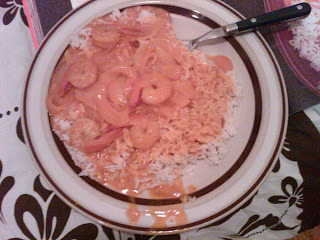 Sautee ginger and white onion in olive oil, mix in curry paste and coconut milk, add in shrimp and enjoy! There you have it! Stay tuned next week for more recipes from Real Girls Eat! I’m half way through the cookbook now! This is such a cute idea! "Whip it up Wednesday" I LOVE it! The first plate looks scrum-didly-umptious!